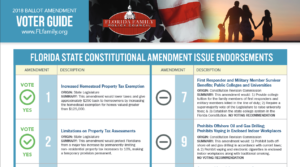 U.S. Senate, Governor and Amendment Voter Guides are now online for the 2018 General Election. Other voter guides on state, local races and judges will be released soon. We will also be providing a detailed written analysis on the amendments in the days to come. Check back to www.FloridaFamilyAction.org often for more voter tool and new releases. All church resources can be found at www.FLfamily.org for the Honoring God initiative.